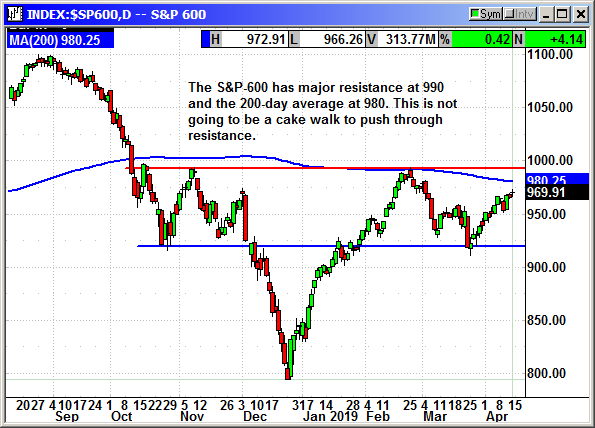 I could post only one chart this week and it would completely explain the market. The big caps are leading the market higher despite some high-profile declines in the Dow components. Chevron erased 42 points on Friday and UnitedHealth erased 89 on Friday and nearly 210 for the last three days. Fortunately, the short squeeze in Disney erased the impact from UnitedHealth. Without several of these major component declines over the last two weeks the Dow would already be at new highs. Fortunately, these individual declines rarely continue, and investors will buy the dip. This will provide a lift in the days ahead. The S&P has pulled to within 23 points of a new high. 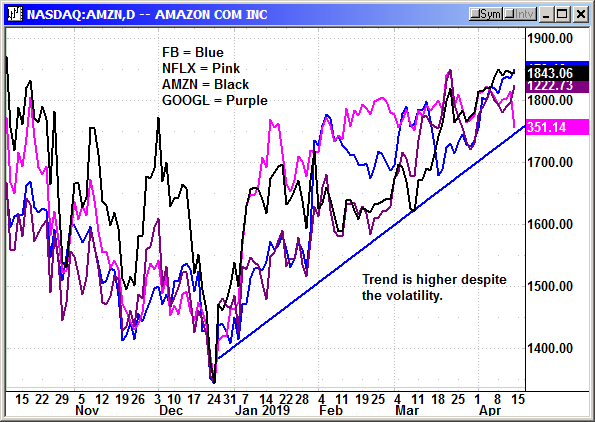 The S&P is enjoying strong market breadth that is offsetting the declines in a few big names. Hopefully that holds up through the earnings cycle since 81 companies have already warned. Normally shares dip when they warn and then rally when they report better than expected results. That could give the index a lift in the days ahead. The only chart I need to post is the A/D chart for the S&P. If the majority of the big caps are rising, then the overall market is going to rise. On Friday the A/D was almost 4:1 in favor of advancers on the S&P. If that ratio holds for a few more days, we will be well over the prior highs. I am not confident that will happen but would be thrilled if it did. 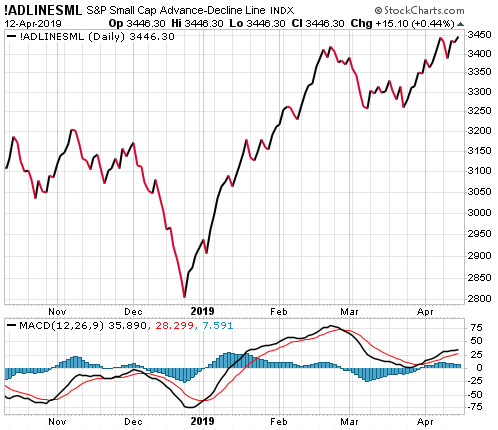 Offsetting the bullishness in the S&P is the weakness in the small caps. Specifically, the Russell 2000 and the S&P-600. 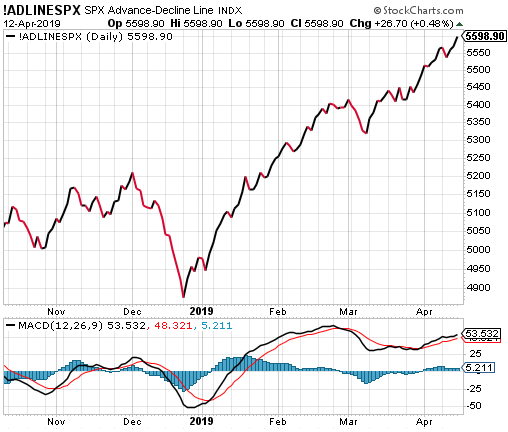 The A/D line is positive and at a new high but the A/D on Friday was only about 1.75:1 advancers over decliners. It was much weaker than the S&P ratio. The S&P Small Cap 600 has major resistance at 980 and 990 and it will take a broader ratio of advancers to push through those levels. 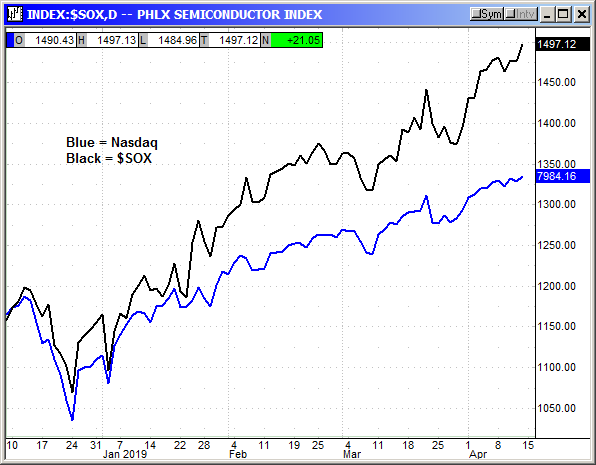 The Biotech Index ($BTK) had a really bad week with a decline of -4.3% and this weighed on both the Nasdaq and the Russell. This is a political decline prompted by fears of cuts to reimbursements in a Medicare for all environment. This decline should fade as common sense prevails. 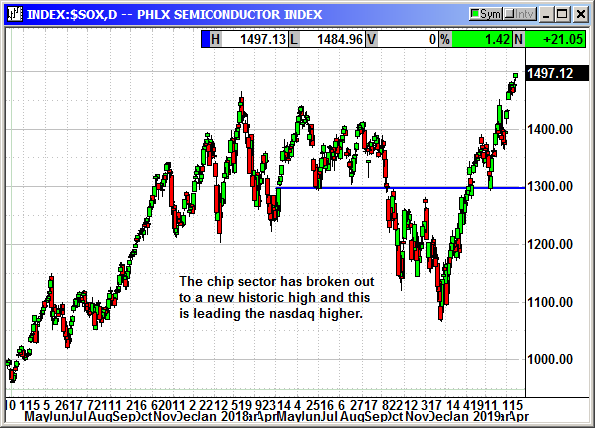 The chip sector is continuing to lead the Nasdaq higher with the $SOX breaking out to a new high on Friday. 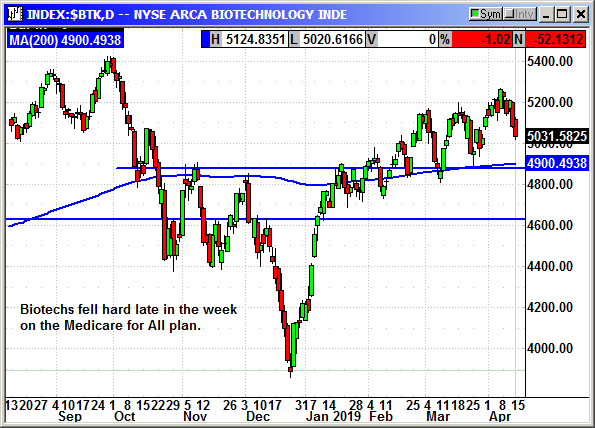 The chip rally offset the weakness from the biotech decline. Unfortunately, the vertical ramp since Christmas is very overextended and should not last much longer. The 5G hoopla is providing lift. The FANG stocks were starting to move back into correlation until Netflix crashed on Friday after the Disney+ launch. This chart has actually turned positive with a higher trend despite the volatility. 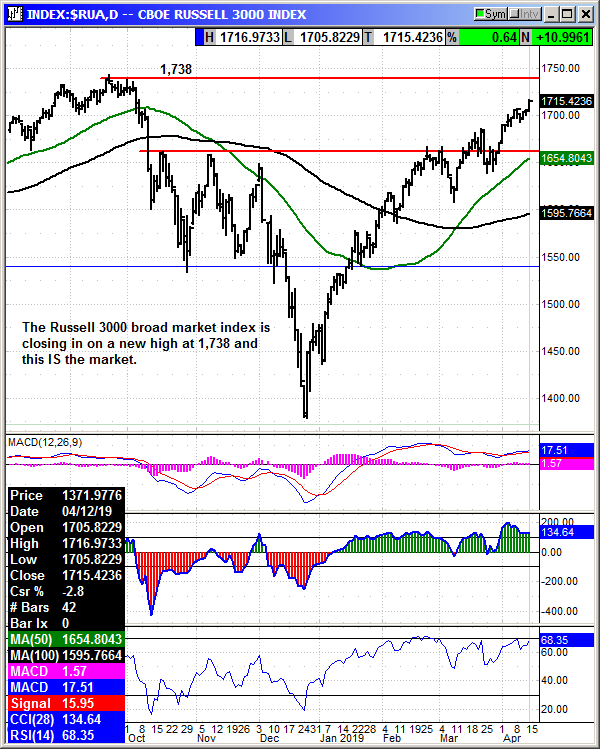 The broadest representation of the market is the Russell 3000 and it is only 23 points from a new high. This is not big caps, mid caps or small caps. This is ALL caps, and this IS the market. We are very close to what could be a break out or a double top. 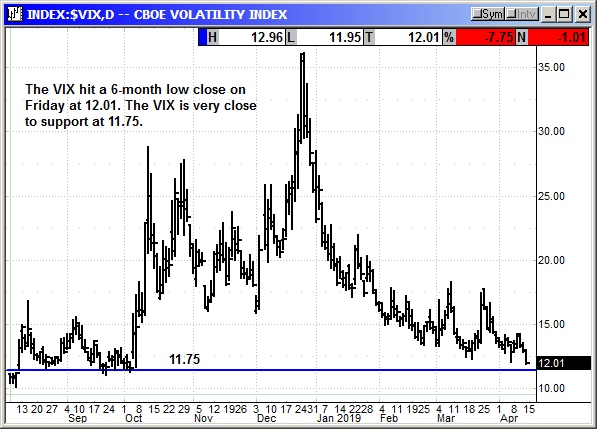 Volatility is rapidly fading and right at a 6-month low. We are back at the levels we saw in October when the market made new highs. I would love to see it hold under 12 for several weeks because that would mean the market had broken out and was making new highs. Investors would be very complacent until the market ran out of steam. I expect to see 20 on the VIX again this summer. I believe we will see new highs. I am not expecting much more than that unless earnings turn significantly positive and the China trade deal is better than expected. I believe we should be cautious once the news highs are made and avoid buying a market top.